Himes was a terrific writer. I heard he planned to wite a book in which his heroes died fighting a Black uprising, but never got around to it. Reminds me of the death of Jaes McClure's Kramer and Zondi characters. Loved this guy. I remember his using the expression 'mother-raper,' and being too naive to realize what he was paraphrasing: back in the day, there was obviously more editorial censorship (or restraint). The last OF hIMES' bookS I read was BLIND MAN WITH A PISTOL---a terrifically evocative title. Some of the drug dealers in Buffalo, N.Y., where I live, have Judas windows & transact all their business through them. I never knew what they were called. Rob, rumor has it that book was written, but not published. In it, (SPOILER ALERT) one of the two detectives turns radical and kills the other. The book may be published in the future, but if it is, don't think I'll read it. I'd prefer to remember Ed and Digger as Himes first created them. David, you weren't the only naive one on that expression of his. As a side note, I first found Himes' detective novels in a used book store in Washington DC, when I was attending the BNDD Basic Agents Class in early 1971. I quickly bought all of that series I could find. Tried a couple of his other books, but didn't have much interest in them. To some degree, you could say that Himes was the forerunner of Walter Mosely's Easy Rawlings series. Himes Coffin Ed and Grave Digger novels were the first I read featuring black folks as police detectives. I later read The Conjure-Man Dies: A mystery Tale of Dark Harlem” by Rudolph Fisher, written in the 1930s before Himes’s Harlem novels. It also is a police procedure but the detective and his medical sidekick are not as violent as Coffin Ed and Grave Digger. 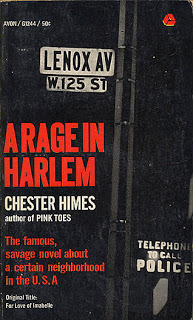 A Rage In Harlem was the first novel in the series that I read. I knew I would enjoy the novels because the faces of the bad guys and the cops who went after them were black, something I discovered in fiction only after I was in college. What did the folks in Harlem think about the “sheriffs of Harlem”? They “believed that Grave Digger Jones and Coffin Ed Johnson would shoot a man stone dead for not standing straight in a line." What the Harlem folks respected was “big shiny pistols and sudden death. It was said in Harlem that Coffin Ed's pistol would kill a rock and Grave Digger's would bury it." When I read those lines, I thought these dudes are badder than Mike Hammer (I had read “I The Jury” while in high school). Himes had to go to France to get his detective novels published, but he and Fisher laid the ground work for Mosley, Bland, and other black writers who entered the mainstream in the 1980s. Louis, you quoted some of my favorite lines. I just didn't have room for all of them, and instead tried to let snippets of all the novels tell the story of those two detectives and the Harlem scene for that time period. R.T., you sent me straight to the book store with this one!